Starcraft Marine of New Paris, Indiana, is serious about fishing and the fishing boats it builds. From its first galvanized steel fishing rowboats produced in 1903, in 2013 it now builds thirteen models of fishing boats from sixteen to twenty-one feet, mostly from aluminum, but two of these models are actually fibreglass. That’s 110 years and four generations of building boats dedicated to the fisherman. Starcraft Marine builds a lot more than just fishing boats. Fishing boats is just one of eight different categories of boats it builds comprising a whopping ninety-one models in total in twenty-seven series within those eight categories which range from fibreglass runabouts and deck boats to aluminum jon, utility, pontoon boats, and more. Just how serious is Starcraft about its fishing? Serious enough to have not a few, not a dozen, but an amazing twenty-seven professional fishermen on its Pro Team. 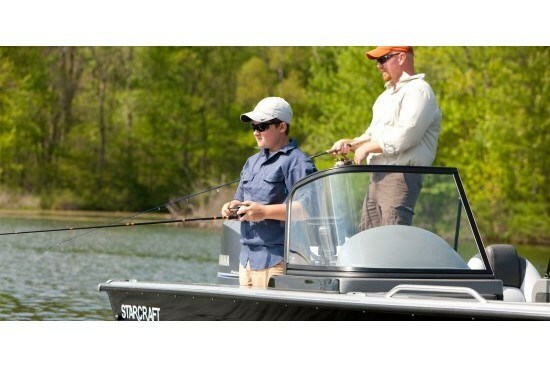 In its own words, “Starcraft is proud to sponsor some of the most successful professionals competing at the national and local levels throughout North America, with numerous World Championships and Team of the Year titles to their credit.” And Starcraft counts on this Pro Team for feedback in the development of its boats to help you realize more enjoyment from your fishing passion. Starcraft seems to place considerable emphasis on what it refers to as “The Starcraft Difference” in how it constructs its boats, so let’s start here. It utilizes “5052 H34 Marine Grade Aluminum which resists dents, dings and corrosion for years of reliability. (Then) Foam Injection between the floor and hull eliminates air and water pockets for greater buoyancy and reduced noise. Full-Length Reverse Chine keeps the bow down during acceleration for faster hole shots and improved cornering, providing a drier ride... TBC Stringer System offers greater strength and resilience, flexing with the waves for a smoother ride. Double Riveted Seams provide a tighter seal for increased structural integrity. (Use of) 7-Ply Pressure Treated Floor/Deck resists warping and other effects of dampness.” It rides on Starcraft’s “Gull Wing” hull with five stabilizing keels on its bottom. Starcraft then adds a limited lifetime warranty on the hull and structure, plus a six-year warranty on all components, carpet, upholstery, and electronics. This warranty includes all parts and labour and is transferrable to the second owner. Inside, the Expedition Sport 186 provides three deluxe movable wood-free pedestal seats (with slider on the helm seat) which can be mounted in six different locations around the boat – four places in the cockpit, one in the bow, and one on the aft casting platform. The back of a full-width rear upholstered bench seat folds down flush to create a very large aft casting platform. Cockpit flooring is vinyl; carpet covers most other interior surfaces. Storage lockers are located at the stern, under the gunwales, in the bow area plus a large in-floor lockable unit which also stores up to five fishing rods. An aerated bow baitwell is standard as is an 18-gallon aerated stern livewell and a 15-gallon aerated bow livewell. 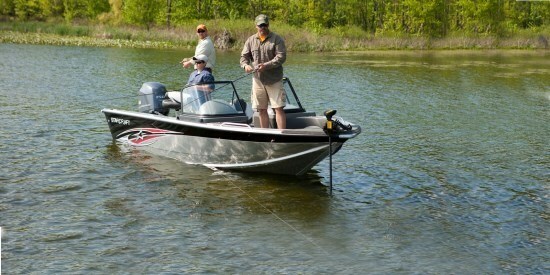 Courtesy lighting, pull-up cleats, a trolling motor plug, as well as reinforced backers for downriggers are all standard. The modern, classy looking, well laid out dash console contains all of the necessary easy to read outboard gauges, resettable type DC breakers, plus standard hydraulic tilt steering. An AM/FM stereo with J-Port for an MP3 player is also standard. 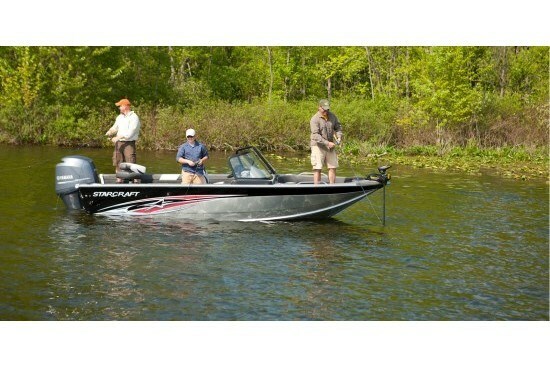 Notable options you might consider include snap-in carpet, power seat pedestals, a two-bank battery charger, Hummingbird 728 fish finder, 70PD trolling motor, many canvas options from basic covers to full enclosures, plus, for family recreational purposes, perhaps the swim platform or ski tow bracket. The Expedition Sport 186 is one more example of how serious Starcraft is about fishing and building fishing boats to suit.